Was the Sixth Earl of Derby Really Shakespeare? The purpose of this site is to explore the hypothesis that the literary works attributed to William Shakespeare were written by William Stanley, the sixth earl of Derby. It is not the purpose of this site to evaluate evidence for any other candidate, including the man from Stratford-on-Avon. I give only a brief synopsis of my opinion regarding some of them. 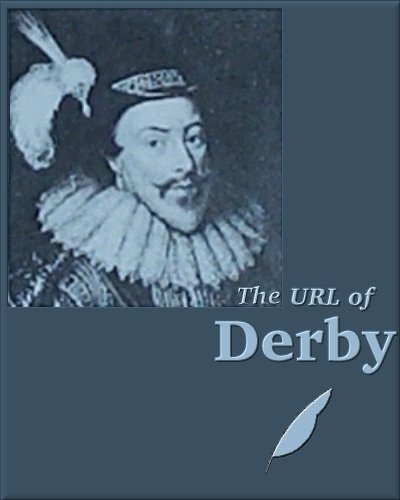 Many web sites and books , discuss the pros and cons of one or several candidates, and all I mean here is to present some of the evidence that points to the earl of Derby as responsible for the works. This site is for those who are already looking for a different author. I have no desire to "preach to the converted", as I know how wearisome it can be to read theory after theory of the authorship question as the writers continually contrast their theories with the same arguments against the man from Stratford. In the following pages, when I use the term "candidate", I am speaking of all of the various candidates for the authorship of the Shake-speare plays. These include the man from Stratford-on-Avon, Oxford, Marlowe, Bacon, and so on. The idea that the businessman and part-time actor from Stratford-on-Avon wrote the works attributed to Shake-speare has become unlikely as a result of internal and external evidence: The internal evidence is in the content of the plays and poems themselves, which provide more than sufficient information to form an idea of the upbringing, education, and environment of the author or authors; the external evidence consists of all known references to, and records regarding, both the Shake-speare literature and the man from Stratford-on-Avon. The weight of this evidence allows us to form some idea of the origin of the works. A tentative hypothesis is proposed that is intended to satisfy all available evidence. The solution is by no means proven, although ultimately it may be proven or disproven should more evidence emerge. And I confess to optimism—I believe that more and substantially convincing evidence will emerge. . Note: To avoid confusion, I will use the name "Shake-speare", when referring to the author of the plays and poems generally recognized as by Shakespeare. (The hyphenated form of a name was typically used to denote a pseudonym, and contemporaneous references to the author of the plays often used the hyphenated "Shake-speare".) When I refer specifically to the man from Stratford-on-Avon, I'll use the spelling "Shakspur", one of the many spellings of his name at the time. I chose this spelling rather than, for example Shakspere, for more clear contrast with Shake-speare. The terms "Stratfordian" and "orthodox" refer to those who believe Shakspur wrote the plays, and "anti-Stratfordian" refers to those who do not. I think William Stanley wrote the works of Shake-speare, for reasons I hope to make apparent. As we will see in the following pages, even Stratfordians associate him with several plays—The Merry Wives of Windsor, A Midsummer Night's Dream, Love's Labour's Lost, and the history plays—and no other candidate is so well indicated by any play at all. Allusions to Shake-speare by his contemporaries, explained away by Stratfordians and ignored by most anti-Stratfordians, fit William Stanley best. William Stanley called himself "Will", as did the author of the Shake-speare Sonnets—not "William", "Francis", "Edward" or anything else. He grew up in an environment saturated with and famous for drama, both in his Lancashire/Cheshire homeland and in his family, again much more than any other candidate. As we will see, he was deeply involved in the drama of the time—with players, in playwriting, with his own company, and with at least one children's company. Again, no other candidate compares. He was of the right age—four years older than the actor from Stratford-on-Avon and longer-lived—so no pre-dating or post-dating of the plays (almost all of which are reasonably dated to within a few years) is required to fit him. His path crossed Shakspur's at just the right time to agree on an author/front-man relationship that would benefit both, perhaps when William Stanley's works were already circulating as by "W. S.". And, finally, to end this thumbnail summary, someone, writing in a handwriting indistiguishable from William Stanley's (and very distinguishable from any other candidate), was writing lines in the one surviving manuscript of a play that are generally agreed to be in Shake-speare's handwriting. Note that a new book by Derbyite John Rollett, including new discoveries, is now available. It is titled William Stanley as Shakespeare: Evidence of Authorship by the Sixth Earl of Derby. For more information, see the publisher's announcement here: William Stanley as Shakespeare. Available from the publisher, and Amazon and other sites now carry the book. I originally wrote a single web page to present the basic case for William Stanley, one I thought could be easily read in a single sitting. I continued to add to the page however, and the thing grew unwieldy. To fix that, I added new sections as separate web pages with some level of links to the main page, but the structure and maintenance issues increased to the point that I decided to reorganize the site into its current multi-page format. In addition to the new organization, this revised site now contains new material, revisions, and corrections. Introduction—This page, including both a graphical and a detailed table of contents. The Contenders—A brief synopsis of the handful of candidates that I consider to be both the best possibilities and that are, not coincidentally, the most popular. Well, Rutland too. 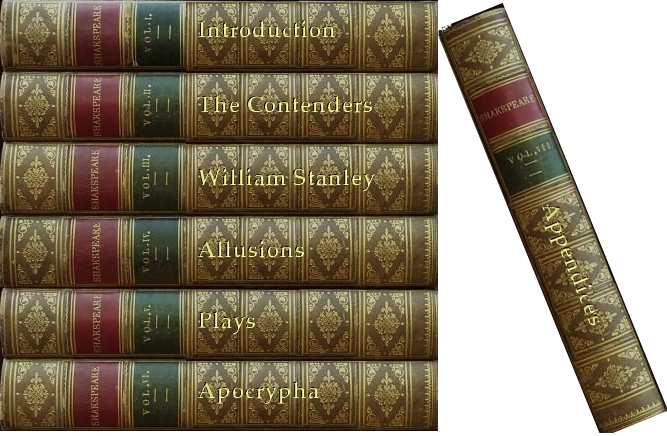 William Stanley—A synopsis of the life of William Stanley, placing him in his family, culture, and time. Allusions—A discussion of the most significant of allusions to Shake-speare in his time. Significant in the sense that they seem to have something to say about who the author was, as opposed to references that are purely literary (in other words, "I was having a beer with Will..." would be more interesting in this context than "My favorite writers are Will... etc."). Plays—A discussion of some plays from the Shake-speare canon, showing how they may relate to William Stanley as author. Apocrypha—A look at some plays, poems, and stories outside the accepted canon that have occasionally been ascribed to Shake-speare, and how they may relate to William Stanley. Additional Venues that William Stanley had available for dramatic performances. Ben Jonson Preliminary notes on Ben Jonson. A search engine for this site is available here. A Brief "Life of William Stanley"
And then thou lov'st me for my name is Will. Diana Price's Shakespeare's Unorthodox Biography, Greenwood Press, 2001 and her associated web site http://www.shakespeare-authorship.com/. The web site The Shakespeare Authorship Page: Dedicated to the Proposition that Shakespeare wrote Shakespeare. Michell, John. Who Wrote Shakespeare?, Thames and Hudson, 1996. A good example of this is the recent discovery by John Rollett of an acrostic unambiguously referencing Derby in nothing less than the First Folio introductory material (William Stanley as Shakespeare: Evidence of Authorship by the Sixth Earl of Derby). I am especially grateful to the libraries at Stanford University and the University of California, Berkeley, for providing free access to their outstanding collections. And God bless the Web. The researchers I quote throughout this site are Stratfordian unless indicated otherwise. Feel free to send me comments, suggestions, thoughts, etc. (To supporters of other candidates, I know you mean well, but I am no longer looking at other candidates, so I will not be looking at your latest website, theory, or book, but thank you.) I've tried to list my sources throughout these pages. I am, of course, responsible for the information here presented, and have attempted to verify facts as much as possible. I would appreciate it if any errors are pointed out to me (John Raithel (john.raithel@gmail.com). All pages copyright © John Raithel.